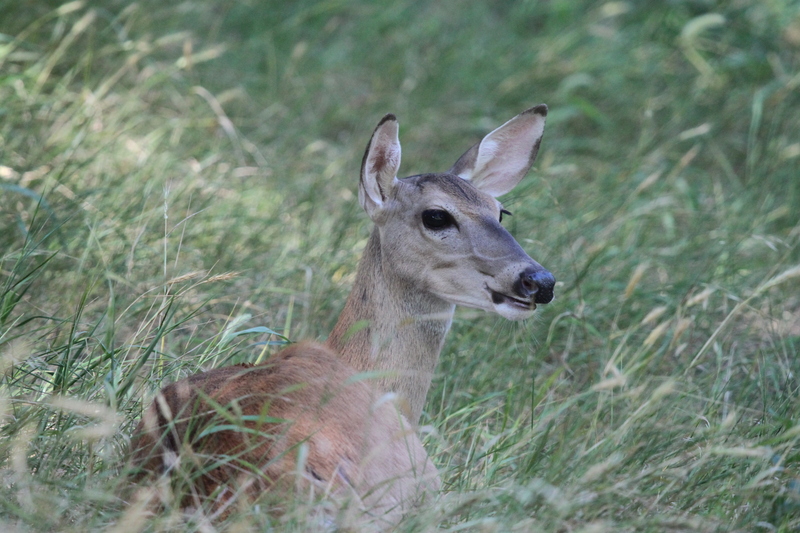 On the evening of June 26th, I found myself wandering the woodland path in search of Daisy deer. I had not seen her in the early morning, but that was not unusual as she had developed a habit of showing up whenever she pleased. Daisy had been on her own since mid-January. She had tried to follow local herds but did not seem to be accepted. This is normal. She was probably considered a danger to a herd, being raised by humans and not knowing the way of deer. We sometimes watched from our back porch, where the wild deer would come to the feeder and water tub down below the slope. Daisy would try to come up to a doe, only to be hoofed away. She never gave up. I was proud, yet sad, that her attempts to join a herd were always met with hooves, lots of bruising and patches of hair missing. Our girl looked rough, and we felt for her, but we knew this was the way of the deer and that she would eventually learn their ways, though not without difficulty. In the meantime, FD and I did our best to let her know it was just fine with us that she chose to hang with her people herd any time she pleased! It was easy to know our little fledgling was a woodpecker. The feet are designed for climbing, having two toes that point forward and two toes that point rearward. The chisel-shaped bill is designed to excavate their food from wood. Sure enough, I hadn’t walked far before Daisy caught my scent and emerged from the woods, looking rather sleepy. I had her apple snack with me and she smacked it down heartily. This was an evening ritual that we had started long ago. Once finished, I pulled the old, soft horse brush out and gave her a good brushing. Daisy had loved this brush since the first time FD massaged her with it. This too, had become an evening ritual. After her brushing, Daisy meandered off to the corn feeder and I fetched my camera from the fallen tree where I had set it down while tending to Daisy’s apple snack and brushing. Whenever I head to the woods, I generally take my camera with me. One never knows what photo opportunity might come along! While I snapped a few photos of Daisy, I kept hearing a sound much like a whistling noise. It made me think of the first time I tried to whistle as a kid. I never was a good whistler. My attempts sounded weak, with plenty of air escaping my lips and not much sound. Whatever I was hearing sounded like these first, weak “whistles” of mine, “Tssssk, tssssssk, tsssssk”. I continued to listen and follow. The sound seemed to be coming from the ground. I finally decided it was being made by something IN the dead grasses. Great. With”snake on the brain” every time I ventured into the woods, I hoped it wasn’t some creepy serpent waiting to bite me! But then, who ever heard of a whistling snake? As I pondered this mystery, I suddenly discovered the whistling critter right at my feet. 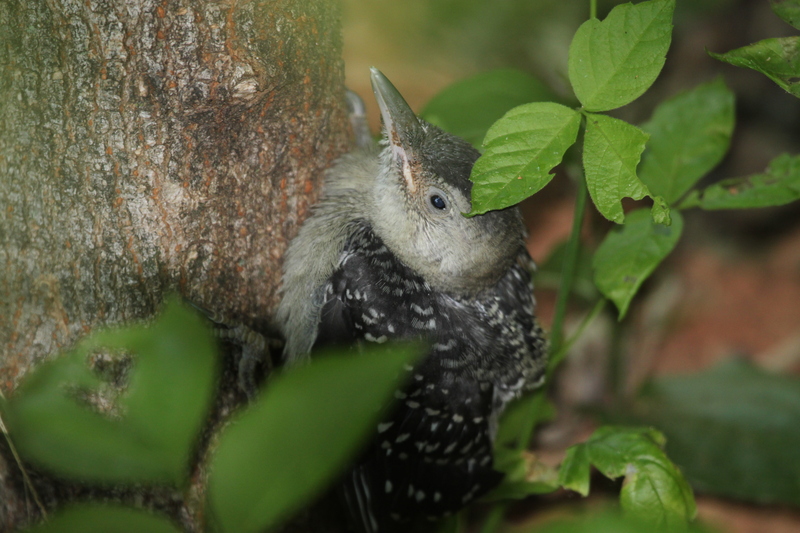 I had stumbled upon a little bird and knew immediately it was a woodpecker fledgling. The feet and the beak left no question about that, but which species of woodpecker was it? The parents are very cautious about approaching the nest cavity, and very watchful for predators. It’s often difficult to see woodpeckers approach as they tend to move from tree to tree, hiding around the backside, not revealing themselves. This is a photo of the male bringing lunch for the little ones. I took a couple of photos of this new discovery, then found a place to sit a distance away so I could just observe. Surely this little fledgling had parents nearby that were tending to it, feeding and encouraging flight. I sat for 30 minutes, with Daisy coming to me to lick and get her Mama’s love. I petted her and brushed her a little more while she licked my arms, chest and neck. It was a ritual of bonding between us carried on since she was a wee, speckled fawn. Focusing my thoughts back to the little woodpecker now, I soon began to worry. It was getting dark and I’d seen no sign of its parents. FD called from San Francisco where he was on business. We discussed what to do with the little fledgling that had now hopped under a fallen, but still live, tree. We decided I should take it in the house for the night. But, what humans feel is safe and necessary, isn’t always what nature would agree with. 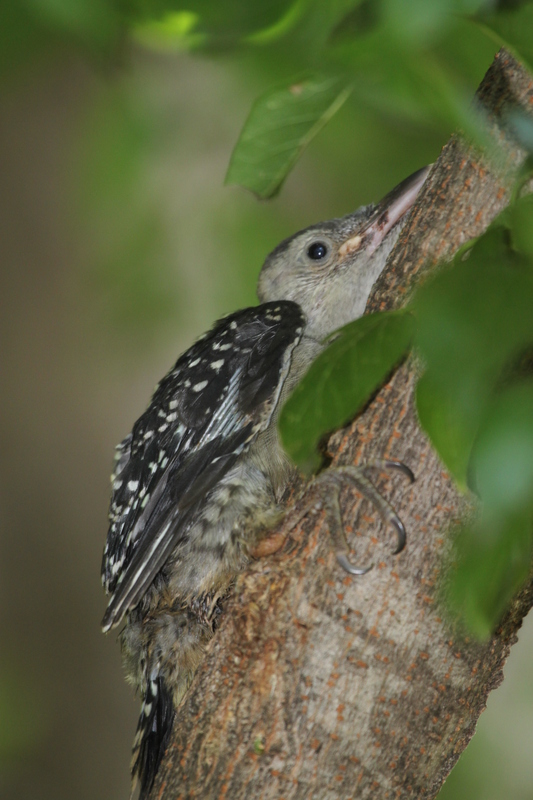 This little woodpecker fledgling would have no part of being brought indoors. It continued to make the whistling noise, and paced and hopped in effort to escape the little box that contained it. I tried putting a barrier over the top of the box so it would be dark and hopefully calm the fledgling, but this tactic only seemed to produce more attempts to escape. Finally, with a heavy heart, I took the little bird back down to the fallen tree. I found a place on a branch where the young woodpecker would be hidden by leaves. After placing him there, I said a prayer of protection and walked back up the slope. Of course I worried all night and didn’t sleep very well, feeling that I might not have done the right thing… but then, what WAS the right thing to do? This male red-breasted woodpecker is efficient at bringing in the food. I was impressed to discover the male incubates the eggs at night, while the female takes the daytime shift. Male woodpeckers ROCK! The next morning, I wasted no time getting back down the slope to see if my little friend was still there. But my heart sunk when I didn’t see it where I had last placed it on the branch of the fallen tree. I looked all around and, thinking it might have fallen, even crawled around on the ground looking for it. But, there was just no sign of it. A little in despair at this point, I was suddenly aware of Daisy deer standing next to me, licking my shorts and nibbling on a button. Silly girl… she was always so quiet on approach. Daisy never doubted who her Mama was, and always seemed to show up when I needed her most. Feeling better from my dose of Daisy’s deer medicine, I ran up the slope to get her a morning treat of what else?? An apple! It would be awesome to have a tree cam where we could observe just what that nest cavity looks like inside! After returning with her apple treat and delighting in Daisy’s happy crunching ritual, I sat down to enjoy my girl and wonder about my little friend of the night before. It was while I sat with Daisy that I heard, once again, the slight, “Tsssssssk, tsssssk, tssssssk” coming from a nearby tree. 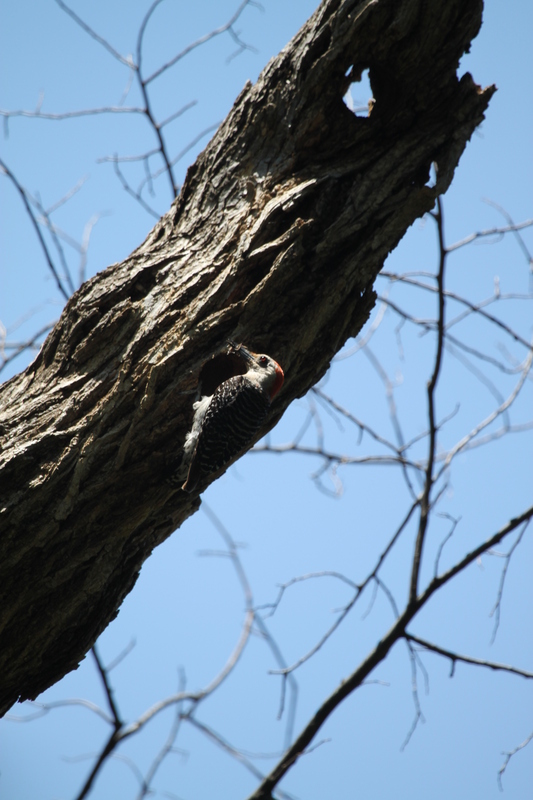 Sure enough, having relocated himself, there was the little woodpecker fledgling, hanging on the trunk of a slender tree. My little friend had made it through the night! Suddenly, I heard the rolling “kwirr” call of an adult woodpecker. Maybe this was one if the little woodpecker’s parents. While I never did see them feeding the little fledgling, I did see the adult birds land nearby. And eventually, I spotted the hole in a dead tree top where I thought its siblings were being tended to. Seeing this, I surmised that this little fellow must have been the eldest and decided there just couldn’t be that much to this flying thing. Like the rookie skier tumbling down the black slopes at Vale, I’m thinking he should have waited for his lessons. Back in the house, I researched the different species of woodpecker and discovered this little fellow was a Red-bellied Woodpecker, which lives year-around in Oklahoma. I believe the parent I photographed feeding the nestlings is the male. The best article on Red-bellied woodpeckers I found was online at “Chipperwoods Bird Observatory”. If you would like to hear the Red-bellied woodpecker calls, I recommend, “Cornell Lab of Ornithology, All About Birds”. Our little friend held firmly to the tree, but he was getting tired and sleepy when I took this photo. Later in the day, I could not find my fledgling friend again. Though I did a thorough search and I listened intently, I did not see the little fellow anywhere. The parents were still feeding the young in the tree above. They were obviously doing their best to care for all concerned, and I decided there was truly nothing more that I could do. I find it is often that way in life. If we do our best and we have a clear conscience at the end of the day, knowing we gave it our all and acted in caring, compassion, and love, then we have done well. Many times we must trust, be it God, the Universe, or our own spirit or gut, to let go of worry and wonder, and simply allow life to be as it is. This is something Daisy deer taught me the day we set her free. There was no sense in looking back and wondering if we did the right thing the day we took her in. We trusted our instinct and spirit that day, raised her as best we could, then set her free. Daisy resting in the tall grass of the woodland floor. She likes to lay in the area of the feeder and water tub in case other wild deer come by. The bird pictures are great. 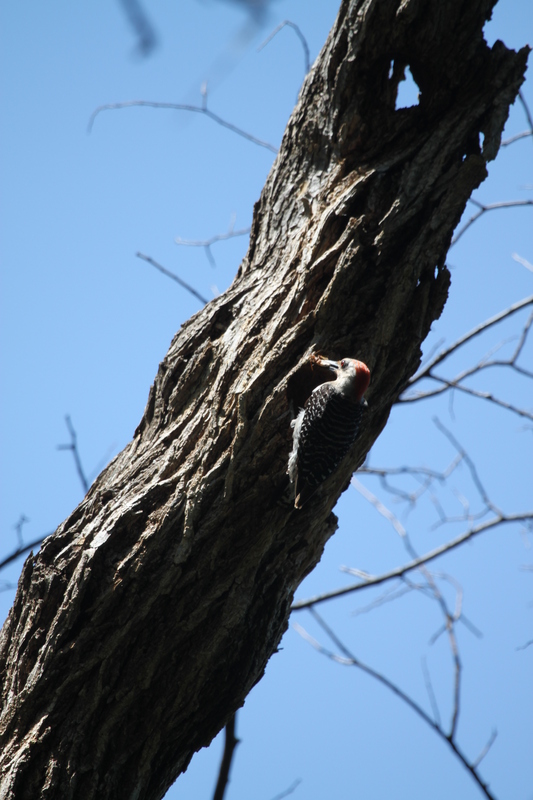 Woodpeckers are so hard to capture on film. I’ve seen a couple tiny ones hop around and scurry on the ground – carefully watched and defended by a parent for several days until the little one was able to fly a bit. Tough to watch. We generally leave fledglings alone for the parents to look after. We have so many feral cats on the place this summer that their predation is a constant worry. We also have a bobcat frequenting the canyon this summer. He has nabbed several of our beautiful collared doves. I have upcoming posts to write about what is going on with Miss Daisy. So many exciting happenings here… if only ALL I had do do was WRITE!! I’d be very happy! You had me getting anxious for a moment. I’m glad I found your corner of the blogging world – you’ve great stories & photos here! Oh thank you for such a wonderful compliment, Sid!! I also take it as a compliment that I had you anxious for a bit! It’s wonderful when I can relay my feelings in writing, and effectively involve my audience. “But, what humans feel is safe and necessary, isn’t always what nature would agree with. ” love this Lori! This is great parenting advice. Once again you have captured nature and delivered her to my inbox. Thank you. Marilyn, you always say the nicest things! Isn’t it wonderful what nature teaches us? Most of the time it is simple observation that teaches us all we need to know. You did exactly the right thing with the little guy. Your farm sounds like a very interesting place to live. Do the woodpeckers come to suet in your yard in the winter? We have four kinds here, but not that one. Our place is just ten acres but teeming with wildlife! We have the Hairy Woodpecker, the Red-bellied, Red-headed, and the Yellow bellied Sap Sucker. 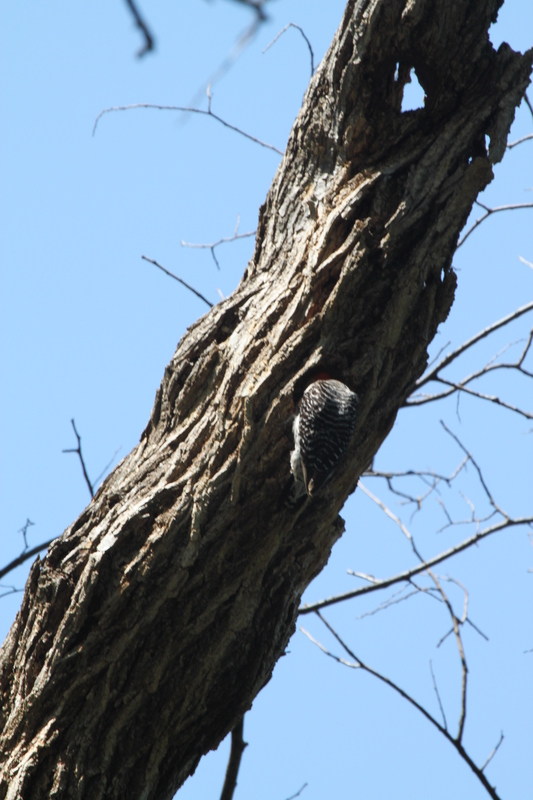 We also have the Downey woodpecker and the Northern Flicker. In the SE part of the state the Pileated Woodpecker is common. We have seen one Pileated on our property, but that is a rare sighting in the SW part of the state. We have never put out suet in the winter, but all woodpeckers like the berry mix bird seed we put out, and the Northern Flickers graze on weed seeds in one area of our yard. You’ve taught me how to recognize a fledgeling woodpecker now. I would have never guessed from the first picture. It’s hard to stand back and not intervene and let nature take it’s natural course. We always think that we must do something when sometimes not doing something is the best course. Any animal injured or not is under caring eyes when the come onto your farm. You just keep following your instinct and you’ll never go wrong. Love the photos and story as always. People will think I’m a freak, but often something just pops into my head and I KNOW. That’s truly what happened with this fledgling. I saw the beak and the feet and knew it was a woodpecker, though I’d never seen a baby woodpecker before. Now the species of woodpecker wasn’t easy to discover. I knew by the size of the fledgling that it was one of the larger woodpeckers and the type of red head on the male parent was another unique feature. It had to be the Red-bellied woodpecker, which I had never seen before. Oklahoma has some great online references for all birds, mammals, reptiles and insects. Plant life here is also well documented. I am all of the time researching something odd that I’ve photographed. I see you manage to find some very unique flowers, and I still remember that ugly hog-nosed snake you came across! That would have scared the living daylights out of me! I think you’ve learned life’s most difficult lesson… there are limits to all we can do… all that’s ever needed from us is all that we CAN wisely do… and wisely respect and trust that we are all in that tender place ourselves. Sometimes we ache with all our heart at not being able to help, but knowing that sometimes we can cause more harm, and discerning the difference is the hardest lesson in life. This is a beautiful pearl of wisdom you have just expressed. These are words I need to remember… words to live by. I think you’ve just left me speechless! You said that so beautifully and delicately. Thank you so much! I am fortunate to have a lot of observation time. I am also at a stage in life where I seem to notice nature that I may have overlooked at earlier times in my life! It was always there to see but I was too busy. I believe you will experience the gift of a deer if that is what you desire. It will be a most wonderful experience for you, and forever life-changing! I believe that that humans can begin to understand communication with non-humans. knowing how to communicate begins with recognizing that communication is already happening, as soon as we encounter one another. If we start by acknowledging the relationship, it’s much easier to figure out what to say, however fumblingly. You are able to talk to the “animals”; maybe more importantly, you know how to talk to the humans about your experiences. Being exposed to stories about connection and reciprocity with the “other” goes a long way toward creating non-violence and building community instead. In the spirit of lovingkindness, generosity, and compassion: I will never think you’re a freak! Thanks for all you do. Oh, owl, that was absolutely beautiful! What pearls of wisdom you have for all of us who share in this wonderful experience! Your kind and loving words mean so much… and I agree, that sharing these experiences leads to an understanding and even compassion that helps to create “non-violence and building community”. There is so much to be gleaned from nature… if only we look to see and listen for the message. Thank you so much for your beautiful comment! Your life is filled with natural wonder, isn’t it? Yes, indeed! And I have to think after some of the crazy, drama-filled, noisy and chaotic days you have at work, you must enjoy reading a bit of my more relaxing, “wild side” adventures!